"Sydney 2000" redirects here. For the Summer Paralympics, see 2000 Summer Paralympics. For the video game, see Sydney 2000 (video game). Sydney was selected as the host city for the 2000 Games in 1993. Teams from 199 countries participated. The Games’ cost was estimated to be A$6.6 billion. The Games received universal acclaim, with the organisation, volunteers, sportsmanship and Australian public being lauded in the international media. Bill Bryson from The Times called the Sydney Games "one of the most successful events on the world stage", saying that they "couldn't be better". James Mossop of the Electronic Telegraph called the Games "such a success that any city considering bidding for future Olympics must be wondering how it can reach the standards set by Sydney", while Jack Todd in the Montreal Gazette suggested that the "IOC should quit while it's ahead. Admit there can never be a better Olympic Games, and be done with it," as "Sydney was both exceptional and the best". In preparing for the 2012 Olympic Games in London, Lord Coe declared the Sydney Games the "benchmark for the spirit of the Games, unquestionably" and admitting that the London organising committee "attempted in a number of ways to emulate what the Sydney Organising Committee did." These were the final Olympic Games under the IOC presidency of Juan Antonio Samaranch. These were also the second Olympic Games to be held in spring and is to date the most recent games not to be held in its more traditional July or August summer slot. The final medal tally was led by the United States, followed by Russia and China with host Australia at fourth place overall. Several World and Olympic records were broken during the games. With little or no controversies, the games were deemed generally successful with the rising standard of competition amongst nations across the world. Sydney won the right to host the Games on 24 September 1993, after being selected over Beijing, Berlin, Istanbul and Manchester in four rounds of voting, at the 101st IOC Session in Monte Carlo, Monaco. The Australian city of Melbourne had lost out to Atlanta for the 1996 Summer Olympics four years earlier. Beijing lost its bid to host the games to Sydney in 1993, but was later awarded the 2008 Summer Olympics in July 2001 after Sydney hosted the previous year, and it would eventually be awarded the 2022 Winter Olympics twenty-two years later in 2015. Although it is impossible to know why members of the International Olympic Committee voted for Sydney over Beijing in 1993, it appears that an important role was played by Human Rights Watch's campaign to "stop Beijing" because of China's human rights record. Many in China were angry at what they saw as U.S.-led interference in the vote, and the outcome contributed to rising anti-Western sentiment in China and tensions in Sino-American relations. The Oxford Olympics Study 2016 estimates the outturn cost of the Sydney 2000 Summer Olympics at USD 5 billion in 2015-dollars and cost overrun at 90% in real terms. This includes sports-related costs only, that is, (i) operational costs incurred by the organizing committee for the purpose of staging the Games, e.g., expenditures for technology, transportation, workforce, administration, security, catering, ceremonies, and medical services, and (ii) direct capital costs incurred by the host city and country or private investors to build, e.g., the competition venues, the Olympic village, international broadcast center, and media and press center, which are required to host the Games. Indirect capital costs are not included, such as for road, rail, or airport infrastructure, or for hotel upgrades or other business investment incurred in preparation for the Games but not directly related to staging the Games. The cost for Sydney 2000 compares with a cost of USD 4.6 billion for Rio 2016, USD 40–44 billion for Beijing 2008 and USD 51 billion for Sochi 2014, the most expensive Olympics in history. Average cost for the Summer Games since 1960 is USD 5.2 billion, average cost overrun is 176%. In 2000, the Auditor-General of New South Wales reported that the Sydney Games cost A$6.6 billion, with a net cost to the public between A$1.7 and A$2.4 billion. 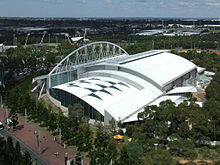 Many venues were constructed in the Sydney Olympic Park, which failed in the years immediately following the Olympics to meet the expected bookings to meet upkeep expenses. In the years leading up to the games, funds were shifted from education and health programs to cover Olympic expenses. It has been estimated that the economic impact of the 2000 Olympics was that A$2.1 billion has been shaved from public consumption. Economic growth was not stimulated to a net benefit and in the years after 2000, foreign tourism to NSW grew by less than tourism to Australia as a whole. A "multiplier" effect on broader economic development is not realised, as a simple "multiplier" analysis fails to capture is that resources have to be redirected from elsewhere: the building of a stadium is at the expense of other public works such as extensions to hospitals. Building sporting venues does not add to the aggregate stock of productive capital in the years following the Games: "Equestrian centres, softball compounds and man-made rapids are not particularly useful beyond their immediate function." In the years after the games, infrastructure issues have been of growing concern to citizens, especially those in the western suburbs of Sydney. Proposed rail links to Sydney's west have been estimated to cost in the same order of magnitude as the public expenditure on the games. Although the Olympic Games Opening Ceremony was not scheduled until 15 September, the football competitions began with preliminary matches on 13 September. Among the pre-ceremony fixtures, host nation Australia lost 1–0 to Italy at the Melbourne Cricket Ground, which was the main stadium for the 1956 Melbourne Olympics. The opening ceremony began with a tribute to the Australian pastoral heritage of the Australian stockmen and the importance of the stock horse in Australia's heritage. It was produced and filmed by Sydney Olympic Broadcasting Organisation and the home nation broadcaster, Channel 7. This was introduced by a lone rider, Steve Jefferys, and his rearing Australian Stock Horse Ammo. At the cracking of Jefferys' stockwhip, a further 120 riders entered the Stadium, their stock horses performing intricate steps, including forming the five Olympic Rings, to a special Olympics version of the theme which Bruce Rowland had previously composed for the 1982 film The Man from Snowy River. The Australian National Anthem was sung, the first verse by Human Nature and the second by Julie Anthony. The ceremony continued, showing many aspects of the land and its people:- the affinity of the mainly coastal-dwelling Australians with the sea that surrounds the "Island Continent". The indigenous occupation of the land, the coming of the First Fleet, the continued immigration from many nations and the rural industry on which the economy of the nation was built, including a display representing the harshness of rural life based on the paintings of Sir Sidney Nolan. Two memorable scenes were the representation of the "Heart" of the country by 200 Aboriginal women from Central Australia who danced up "the mighty spirit of God to protect the Games" and the overwhelmingly noisy representation of the construction industry by hundreds of tap-dancing teenagers. Because Bibi Salisachs (the wife of Juan Antonio Samaranch, the IOC President) was seriously ill and not able to accompany her husband to the Olympics, former Australian Olympic Champion swimmer and member of the Parliament of New South Wales, Dawn Fraser, accompanied Samaranch during the Australian cultural display, explaining to him some of the cultural references that are unfamiliar to non-Australians. A record 199 nations entered the stadium, with a record 80 of them winning at least one medal. The only missing IOC member was Afghanistan (banned due to the extremist rule of the Taliban's oppression of women and its prohibition of sports). The ceremony featured a unified entrance by the athletes of North and South Korea,[a] using a specially designed unification flag: a white background flag with a blue map of the Korean Peninsula. Four athletes from East Timor also marched in the parade of nations as Individual Olympic Athletes and marched directly before the Host country. Although the country-to-be had no National Olympic Committee then, they were allowed to compete under the Olympic Flag with country code IOA. The Governor-General, Sir William Deane, opened the games. The Olympic Flag was carried around the arena by eight former Australian Olympic champions: Bill Roycroft, Murray Rose, Liane Tooth, Gillian Rolton, Marjorie Jackson, Lorraine Crapp, Michael Wenden and Nick Green. During the raising of the Olympics Flag, the Olympic Hymn was sung by the Millennium Choir of the Greek Orthodox Archdiocese of Australia in Greek. Following this, Tina Arena sang a purpose-written pop song, The Flame. The opening ceremony concluded with the lighting of the Olympic Flame. Former Australian Olympic champion Herb Elliott brought the Olympic Flame into the stadium. Then, celebrating 100 years of women's participation in the Olympic Games, former Australian women Olympic medalists: Betty Cuthbert and Raelene Boyle, Dawn Fraser, Shirley Strickland (later Shirley Strickland de la Hunty), Shane Gould and Debbie Flintoff-King brought the torch through the stadium, handing it over to Cathy Freeman, who lit the flame in the cauldron within a circle of fire. The planned spectacular climax to the ceremony was delayed by the technical glitch of a computer switch which malfunctioned, causing the sequence to shut down by giving a false reading. This meant that the Olympic flame was suspended in mid-air for about four minutes, rather than immediately rising up a water-covered ramp to the top of the stadium. When the cause of the problem was discovered, the program was overridden and the cauldron continued its course, and the ceremony concluded with a spectacular fireworks display. The first medals of the Games were awarded in the women's 10 metre air rifle competition, which was won by Nancy Johnson of the United States. The Triathlon made its Olympic debut with the women's race. Set in the surroundings of the Sydney Opera House, Brigitte McMahon representing Switzerland swam, cycled and ran to the first gold medal in the sport, beating the favoured home athletes such as Michelie Jones who won silver. McMahon only passed Jones in sight of the finish line. The first star of the Games was Ian Thorpe. The 17-year-old Australian first set a new world record in the 400 m freestyle final before competing in an exciting 4 × 100 m freestyle final. Swimming the last leg, Thorpe passed the leading Americans and arrived in a new world record time, two tenths of a second ahead of the Americans. In the same event for women, the Americans also broke the world record, finishing ahead of the Netherlands and Sweden. Samaranch had to leave for home, as his wife was severely ill. Upon arrival, his wife had already died. Samaranch returned to Sydney four days later. The Olympic flag was flown at half-staff during the period as a sign of respect to Samaranch's wife. Canadian Simon Whitfield sprinted away in the last 100 metres of the men's triathlon, becoming the inaugural winner in the event. On the cycling track, Robert Bartko beat fellow German Jens Lehmann in the individual pursuit, setting a new Olympic Record. Leontien Zijlaard-van Moorsel set a world record in the semi-finals the same event for women. In the swimming pool, American Tom Dolan beat the world record in the 400 m medley, successfully defending the title he won in Atlanta four years prior. Dutchwoman Inge de Bruijn also clocked a new world record, beating her own time in the 100 m butterfly final to win by more than a second. The main event for the Australians on the fourth day of the Games was the 200 m freestyle. Dutchman Pieter van den Hoogenband had broken the world record in the semi-finals, taking it from the new Australian hero Ian Thorpe, who came close to the world record in his semi-final heat. As the final race finished, Van den Hoogenband's time was exactly the same as in the semi-finals, finishing ahead of Thorpe by half a second. Zijlaard-van Moorsel lived up to the expectations set by her world record in cycling in the semis by winning the gold medal. Controversy erupted at the Women's Gymnastics All-Around final, when gymnast after gymnast fell on the vault. Some gymnasts were physically injured, and all were shaken, but nothing was done to try to discover the reason most gymnasts were having severe problems. Finally, in the middle of the third round (out of four), it was determined that the vault horse had been set 5 cm too low – enough of a difference to throw off the impeccable timing of many of these world-class athletes. While athletes were allowed to vault again, the remedy did not fully repair injuries and shaken confidence. The medals were eventually all won by Romanian gymnasts, with Andreea Raducan becoming the first athlete from her country to win the title since Nadia Comaneci in 1976. Teammates Simona Amanar and Maria Olaru took silver and bronze, respectively. This result also marked the first sweep of the event since the Soviet Union's in 1960. The swimming 4 x 100-metre medley relay of B.J. Bedford, Megan Quann (Jendrick), Jenny Thompson and Dara Torres became the first women's relay under 4-minutes, swimming 3:58 and setting a world record, claiming the gold medal for the United States. Rulon Gardner, never a NCAA champion or a world medalist, beat Alexander Karelin of Russia to win gold in the super heavyweight class, Greco-Roman wrestling. Karelin had won gold in Seoul, Barcelona and Atlanta. Before this fight he had never lost in international competition, had been unbeaten in all competitions in 13 years, and had not surrendered a point in a decade. Australian Cathy Freeman won the 400 metre final in front of a jubilant Sydney crowd at the Olympic Stadium, ahead of Lorraine Graham of Jamaica and Katharine Merry of Great Britain. Freeman's win made her the first competitor in Olympic Games history to light the Olympic Flame and then go on to win a Gold Medal. The attendance at the stadium was 112,524 – the largest attendance for any sport in Olympic Games history. In a men's basketball pool match between the USA and France, the USA's Vince Carter made one of the most famous dunks in basketball history. After getting the ball off a steal, the 6'6"/1.98 m Carter drove to the basket, with 7'2"/2.18 m centre Frédéric Weis in his way. Carter jumped, spread his legs in midair, scraped Weis' head on the way up, and dunked. The French media dubbed the feat le dunk de la mort ("the dunk of death"). The Canadian flag at athletes' village is lowered to half-staff as Canadian athletes pay tribute to former prime minister Pierre Trudeau after hearing of his death in Montreal (Because of the time difference, it was 29 September in Sydney when Trudeau died). The Canadian flag flew at half-staff for the remainder of the Olympics, on orders from both IOC President Juan Antonio Samaranch and Canadian Foreign Affairs Minister Lloyd Axworthy, as the state funeral did not take place until 3 October. Cameroon won a historic gold medal over Spain in the Men's Olympic Football Final at the Olympic Stadium. The game went to a penalty shootout, which was won by Cameroon 5–3. The last event of the games was the Men's Marathon, contested on a course that started in North Sydney. The event was won by Ethiopian Genzhnge Abera, with Eric Wananina second and Tesefe Tola, also of Ethiopia third. It was the first time since the 1968 Olympics that an Ethiopian had won the gold medal in this event. The Closing Ceremony commenced with Christine Anu singing her version of the Warumpi Band's song, My Island Home. She performed with several Aboriginal dancers atop the Geodome Stage in the middle of the stadium, around which several hundred umbrella and lampbox kids created an image of Aboriginal dreamtime. The Geodome Stage was used throughout the ceremony, which is a flat stage which is mechanically raised into the shape of a Geode. "I am proud and happy to proclaim that you have presented to the world the best Olympic Games ever." Subsequent Summer Olympics held in Athens, Beijing and London have been described by Samaranch's successor, Jacques Rogge, as "unforgettable, dream Games", "truly exceptional" and "happy and glorious games" respectively – the practice of declaring games the "best ever" having been retired after the 2000 games. The Olympic Hymn was sung by soprano Yvonne Kenny. The ceremony also featured performing artists such as Jimmy Barnes, INXS, Midnight Oil, Kylie Minogue, Slim Dusty, Christine Anu, Nikki Webster, John Paul Young, Men at Work, Melbourne-based singer Vanessa Amorosi, Tommy Emmanuel, and pop duo Savage Garden. The Games were then handed over to their modern birthplace, Athens, which succeeded Sydney as summer Olympic host city. Two Greek flags were raised; one to honour the birthplace of the Olympics, and the other to honour Athens. The ceremony concluded with a huge fireworks display on Sydney Harbour. The fireworks display itself concluded with a very low flyover of Stadium Australia by an RAAF F-111C which performed a dump-and-burn manoeuvre synchronised with the extinction of the Olympic Flame. This created the appearance of the flame being carried away into the sky, flying in a northeasterly direction out across Sydney Harbour and ultimately towards Athens in a symbolic handover. In honour of her gold medal win during the games, Cathy Freeman represented Oceania in carrying the Olympic flag, joining Archbishop Desmond Tutu (Africa), John Glenn (The Americas), Kazuyoshi Funaki (Asia), Lech Wałęsa (Europe), Jean-Michel Cousteau (Environment), Jean-Claude Killy (Sport), and Steven Spielberg (Culture) when it was raised again, at the XIX Olympic Winter Games in Salt Lake City; the opening ceremony there took place on 8 February 2002. Although demonstration sports were abolished following the 1992 Summer Olympics the Sydney Olympics featured wheelchair racing as exhibition events on the athletics schedule. Special quarantine conditions were introduced to allow entry of horses into Australia to participate in equestrian events, avoiding the need for such events to take place elsewhere as had happened at the 1956 Summer Olympics in Melbourne. These are the top ten nations that won medals in the 2000 Games. The ranking in this table is based on information provided by the International Olympic Committee. Some other sources may be inconsistent due to not taking into account all later doping cases. 199 National Olympic Committees (NOCs) participated in the Sydney Games, two more than in the 1996 Summer Olympics. In addition, there were four Timorese Individual Olympic Athletes at the 2000 Summer Olympics. Eritrea, Federated States of Micronesia and Palau made their Olympic debut this year. Afghanistan was the only 1996 participant that did not participate in 2000, having been banned due to the extremist rule of the Taliban's oppression of women and its prohibition of sports. SOCOG organisational structure circa 1998 – five groups and 33 divisions reporting to the CEO are organised primarily along functional lines with only a limited number of divisions (e.g. Interstate Football and Villages) anticipating a venue focussed design. SOCOG organisational structure circa 1999 – functional divisions and precinct/venue streams are organised in a matrix structure linked to the Main Operations Centre (MOC). Some functions such as Project Management (in the Games Coordination group) continue to exist largely outside this matrix structure. These bodies are often collectively referred to as the "Olympic Family". Organisation of the 2000 Summer Paralympics was the responsibility of SPOC the Sydney Paralympic Organising Committee. However much of the planning and operation of the Paralympic Games was outsourced to SOCOG such that most operational programmes planned both the Olympic and Paralympic Games. Organisation of the Games included not only the actual sporting events but also the management (and sometimes construction) of the sporting venues and surrounding precincts, the organisation of the Sydney Olympic Arts Festival and Olympic torch relay. The relay began in Greece and travelled to Australia via numerous Oceania island nations. The internal organisation of SOCOG evolved over the phases of the project and changed, sometimes radically, several times. In late 1998 the design was principally functional. The top two tiers below the CEO Sandy Hollway consisted of five groups (managed by Group General Managers and the Deputy CEO) and twenty divisions (managed by divisional General Managers), which in turn were further broken up into programmes and sub-programmes or projects. In 1999 functional areas (FAs) broke up into geographic precinct and venue teams (managed by Precinct Managers and Venue Managers) with functional area staff reporting to both the FA manager and the venue manager. Ie, SOCOG moved to a matrix structure. The Interstate Football division extant in 1998 was the first of these geographically based venue teams. The origins of the volunteer programme for Sydney 2000 dates back to the bid, as early as 1992. On 17 December 1992, a group of Sydney citizens, interested in the prospect of hosting the 2000 Olympic and Paralympic Games, gathered for a meeting at Sports House, at Wentworth Park in Sydney. In the period leading up to 1999, after Sydney had won the bid, the small group of volunteers grew from approximately 42 to around 500. These volunteers became known as Pioneer Volunteers. The Pioneer Volunteer programme was managed internally by SOCOG's Volunteer Services Department in consultation with prominent peak groups like The Centre for Volunteering (Volunteering and TAFE. Some of the Pioneer Volunteers still meet every four months, an unseen legacy of the games which brought together a community spirit not seen before. During the Olympic games tens of thousands of volunteers, the official figure was placed at 46,967, helped everywhere at the Olympic venues and elsewhere in the city. They were honoured with a parade like the athletes had a few days before. The bid logo, designed by architect and designer Michael Bryce, featured a colourful, stylised image of the Sydney Opera House. The official logo – also referred to as the "Millennium Man" – took the image of the bid logo and combined it with a stylised image of a runner to form a torchbearer in motion; formed by two small yellow boomerangs for arms and a larger red boomerang for legs. The Olympic torch is represented through a blue smoke trail, which draws the iconic peaks of the Sydney Opera House. The design process of the official logo, as well as all other aspects of the Olympic Games' visual design identity, was awarded to Melbourne design studio FHA Image Design. The Sydney Olympics brand identity project officially commenced in 1993. The official mascots chosen for the 2000 Summer Olympics were Syd the platypus, Millie the echidna, and Olly the kookaburra and were designed by Matthew Hattan and Jozef Szekeres and named by Philip Sheldon of agency Weekes Morris Osborn in response to the original SOCOG recommendation of Murray, Margery and Dawn after famous Australian athletes. There was also an unofficial mascot, Fatso the Fat-Arsed Wombat, which was popularised by comedy team Roy Slaven and HG Nelson on the TV series The Dream with Roy and HG. Roy and HG also frequently disparaged the official mascots on their television program. The bronze medals for the 2000 Olympics were created from melted down Australian 1 cent and 2 cent coins – which had been removed from circulation from 1992 onward. The bouquets handed to medal recipients incorporated foliage from the Grevillea baileyana, also known as the white oak. The International Olympic Committee awarded Sydney and its inhabitants with the "Pierre de Coubertin Trophy" in recognition of the collaboration and happiness shown by the people of Sydney during the event to all the athletes and visitors around the world. The New South Wales Police Force was granted use of the Olympic Rings in the New South Wales Police Force Olympic Commendation and the New South Wales Police Force Olympic Citation for having staged the "safest" games ever. In F.J. Campbell's 2018 novel No Number Nine, the last part of the book is set at the Sydney 2000 Olympics. In Tom Clancy's thriller Rainbow Six, the 2000 Olympic Games are the setting of a plot by eco-terrorists, who plan to use the games in order to spread a terrible new plague throughout the world. In Morris Gleitzman's children's book Toad Rage, a cane toad travels to Sydney in a bid to become the Olympic mascot. ^ The national teams of North Korea and South Korea competed separately in the Olympic events, even though they marched together as a unified Korean team in the opening ceremony. ^ a b How the media viewed the Sydney Olympics. Cool Running. Retrieved on 19 April 2015. ^ Mossop, James (1 October 2000). "Sydney has set the highest standards for future hosts". The Daily Telegraph. London. Retrieved 26 October 2013. ^ "Sydney 2000 the Olympic Games benchmark, Sebastian Coe says". The Australian. 25 July 2012. ^ Keys, Barbara (2018). "Harnessing Human Rights to the Olympic Games: Human Rights Watch and the 1993 'Stop Beijing' Campaign". Journal of Contemporary History. 53 (2): 415–438. doi:10.1177/0022009416667791. ^ Flyvbjerg, Bent; Stewart, Allison; Budzier, Alexander (2016). The Oxford Olympics Study 2016: Cost and Cost Overrun at the Games. Oxford: Saïd Business School Working Papers (Oxford: University of Oxford). pp. 9, 13. SSRN 2804554. ^ "Sydney 2000 – Auditor Slams Costs". liebreich.com. 23 April 2003. Archived from the original on 7 February 2005. ^ Poynter, Gavin; MacRury, Iain (6 October 2009). Olympic Cities: 2012 and the Remaking of London. Ashgate Publishing, Ltd. pp. 137–. ISBN 9780754671008. Retrieved 21 February 2013. ^ Findling, John E.; Pelle, Kimberly D. (2004). Encyclopedia of the Modern Olympic Movement. Greenwood Publishing Group. pp. 252–. ISBN 9780313322785. Retrieved 21 February 2013. ^ Saulwick, Jacob (12 April 2008). "No medals for economic benefits of the Games". Business Day. Archived from the original on 16 May 2008. Retrieved 16 April 2008. The article is based largely on a recent study by James Giesecke and John Madden from the Centre of Policy Studies at Monash University. ^  Afghanistan-Analysts. Retrieved on 19 April 2015. ^ 11 Olympic Theme Songs, Dissected. Time (26 July 2012). Retrieved 3 May 2014. ^ "Patrick Mboma". Archived from the original on 17 May 2013. Retrieved 9 July 2010. ^ Longman, Jere (2 October 2000). "Sydney 2000: Closing Ceremony; A fond farewell from Australia". New York Times. Retrieved 12 May 2010. ^ "Reflections on the Olympic Wheelchair Racing Exhibition Races". Archived from the original on 17 June 2009. Retrieved 15 June 2009. ^ "Strict quarantine conditions for overseas horses competing in the Sydney 2000 Games". Department of Agriculture. 26 November 1999. Archived from the original on 7 May 2015. Retrieved 23 December 2014. ^ "Sydney 2000". International Olympic Committee. Retrieved 17 January 2013. ^ "2000 Summer Games". Database Olympics. Archived from the original on 15 January 2013. Retrieved 17 January 2013. ^ "Sydney 2000 International Olympic Committee". Archived from the original on 22 July 2009. Retrieved 8 July 2009. ^ Official Report of the XXVII Olympiad, Volume One: Preparing for the Games (PDF). Sydney Organising Committee for the Olympic Games. 2001. p. 178. ISBN 978-0-9579616-0-9. ^ "Architect Michael Bryce". ABC Queensland. 19 October 2005. Archived from the original on 1 November 2007. ^ White, Leanne (9 June 2011). "The Sydney 2000 Olympic Games Bid: Marketing Indigenous Australia for the Millennium Games". The International Journal of the History of Sport. 28 (10): 1455. doi:10.1080/09523367.2011.578341. Retrieved 17 August 2014. ^ Desktop (27 September 2012). "Top Ten Australian Logos – 8th | Desktop". Desktop | The Culture of Design. Desktop Magazine. Retrieved 26 November 2014. ^ "Syd, Olly and Millie – mascots of the 2000 Olympic Summer Games". Beijing2008. 5 August 2004. Archived from the original on 17 May 2013. Retrieved 25 October 2006. ^ "The Rise of Fatso – The Fat Arsed Sydney Olympics Wombat". Strategic Resources International. February 2001. Retrieved 10 October 2008. ^ Marr, Jim (8 December 2000). "Satire: Roy Slaven on the Rampage". Workers Online (81). Retrieved 30 June 2006. ^ "Amply-rumped wombat was real darling of the Games". Sports Illustrated. 1 October 2000. Archived from the original on 6 October 2008. Retrieved 10 October 2008. ^ Olde, Peter (2000). "The Olympic Bouquets" (PDF). Grevillea Study Group Newsletter (57): 8. ISSN 0725-8755. Retrieved 14 November 2011. ^ "Olympic History". Archived from the original on 22 July 2009. Retrieved 8 July 2009. ^ John Dugdale (3 October 2013). "Tom Clancy: The top five novels". The Guardian. Retrieved 27 March 2018. ^ "Second Grade Rules, Amber Brown By Paula Danziger". Chicago Tribune. 8 August 2004. Retrieved 27 March 2018. Wikimedia Commons has media related to 2000 Summer Olympics. "Sydney 2000". Olympic.org. International Olympic Committee. 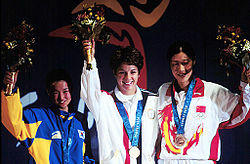 "Results and Medalists — 2000 Summer Olympics". Olympic.org. International Olympic Committee. "Satellite view of 2000 Sydney Olympics sites". Archived from the original on 18 April 2004. This page was last edited on 27 March 2019, at 05:33 (UTC).